View the webinar and share it with a co-worker. 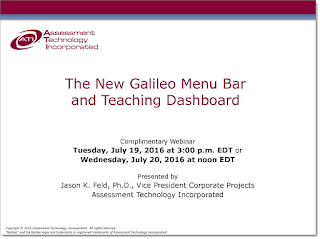 ATI webinars offer exciting insight into Galileo. They are complimentary and are recorded for later viewing. The recordings can be accessed from the ATI website along with many other helpful videos, Dialogs, and webisodes. 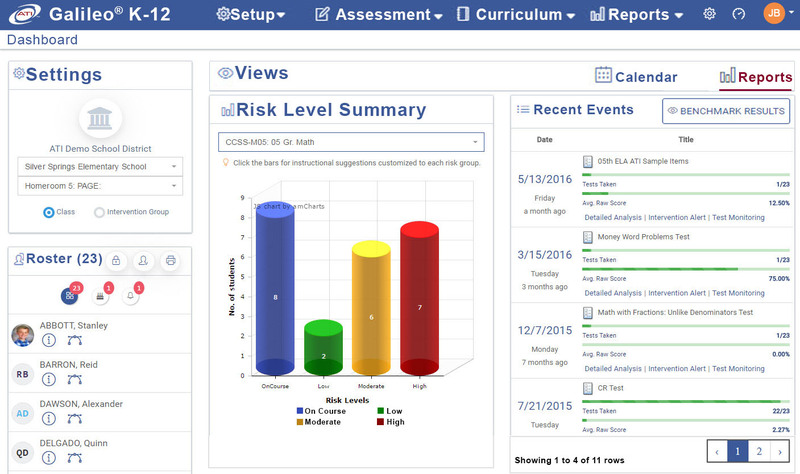 It is now easier than ever to build and administer curriculum materials and assessments as well as to access data which can inform next instructional steps to promote learning. 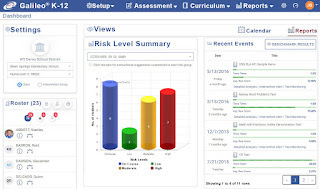 Galileo's powerful tools have two new interfaces including a streamlined menu bar and an easy-to-use Teaching Dashboard offering a fresh look and enhanced functionality designed specifically with teacher use in mind. Each webinar will conclude with a Question and Answer session and offer attendees the opportunity to access Galileo K-12 Online for a hands-on demonstration. Register today! 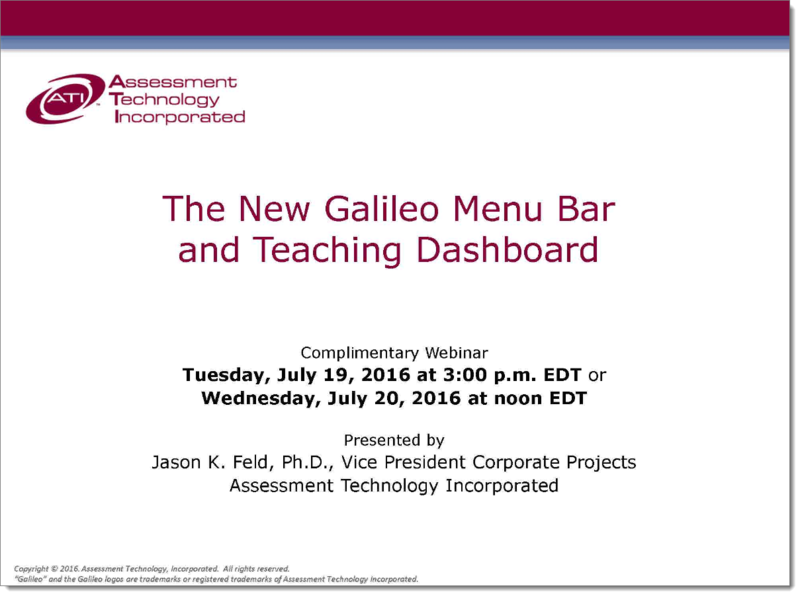 The Galileo Teaching Dashboard offers a fresh look and enhanced functionality. July is here, and school administrators are busy planning schedules and pre-enrolling students. Rosters will be finalized prior to students arriving, and data shipped to ATI to update class lists and rosters in Galileo K-12 Online. The district or charter school provides an export from their Student Information System (SIS) that lists all classes, teachers and students. ATI staff import this data to a test database and perform a thorough quality assurance review – any problems are resolved with the submitter during the QA process. ATI staff import the provided information directly into Galileo K-12 Online. Detailed instructions for GDI can be found in the Tech Support section of Galileo K-12 (and Pre-K) Online or via link at the end of this post. Importation instructions are updated for each school year. In preparation for 2016-17, GDI staff are introducing a new “recommended GDI column format.” The new, optional formatting is intended to enable more efficient processing for districts following this column format. Be sure to include all the required information listed in the importation instructions in your file. Recommended information is not required in the Galileo database, but failure to include this information will prevent some report filtering. • Any omitted optional data can be imported at any time during the school year, either as part of GDI or as a separate process – contact ATI for more information. If TeacherID or StudentID fields change within your SIS, please notify ATI prior to providing any import files to ensure proper transition within the Galileo database. Large-scale ID changes may require extra processing time so please notify ATI as far in advance as possible so we can help you plan accordingly. Due to new class structures and teacher assignments, the quality assurance process is typically longest during the first upload of the year. Getting uploads underway as soon as data is available will help ensure adequate processing time before your first assessments of the year. Files often require a full seven business days to complete, so allocating extra time is beneficial. Participation in Instructional Effectiveness (IE) initiatives with ATI may require a roster for all responsible teachers to be imported. Participation in No-Evaluation Importation (NEI), the process of preparing for frequent updates to rosters and data within Galileo K-12 Online, requires three successive no-change imports at the beginning of each school year. Working alongside our import specialists to adjust your import format may be necessary during this process. If you have any questions about GDI, please refer to the Galileo Data Importation instructions at http://www.ati-online.com/pdfs/ImportInstructionsK-12.pdf or contact us at GalileoDataImport@ati-online.com.